Oh, lovely, lovely June. Why must you go so soon? (Unintentional rhyme, but I’ll go with it!) June is a great month because the weather gets a million times nicer, school ends, and you have the entire summer ahead of you to be excited about. This June in particular was an excellent one, so I have plenty of favorites to share with you all! “Flightless Bird, American Mouth” by Iron & Wine: This song is so relaxing and beautiful- perfect for those nostalgic summer nights! “Nine in the Afternoon” by Panic! At the Disco: I love singing along to this one on car rides with friends. It’s catchy, clever, and has that awesome Panic flair! “Lost in My Mind” by The Head and the Heart: I first heard this song a few summers ago and ever since then it has become one of my very favorite summer songs. There’s something about it that never fails to put a smile on my face and remind me of all the wonderful summer memories I’ve made over the years. It has such an earthy feel to it, too! Lost: I’ve been absolutely hooked on watching lost this past month, and IT’S SO GOOD! I wrote about it earlier in the month in my post titled In Which I Confess My Recent Obsession with Lost. I’m almost done with the first season and I love it so much! If you’d like to be updated on my progress and my reactions to various episodes, be sure to follow the hashtag #hollywatcheslost on Twitter and follow me @peanutfreeisme. Jurassic World: HOLY COW, PEOPLE. THIS MOVIE IS FANTASTIC. I’ve never seen the original movies, but I loved Michael Crichton’s novel Jurassic Park so I suspected that I would enjoy this movie. I definitely did not think I would love it this much, though! Everything about it was amazing: the special effects, the suspenseful plot, and Chris Pratt, of course! I plan on posting a full review of this movie in the near future, so stay tuned! Road Tripping: I adore a good road trip. They’re awesome because you get to travel to new and exciting places all while making memories with the people you love. In fact, as you read this I am in West Virginia for my brother’s soccer tournament. I’ve never been to West Virginia before and it’s about a twelve-hour drive from my house, so it should be interesting! I’m sure I’ll have some updates about it when I get back. Yoga: I’ve always wanted to make yoga a part of my daily (or more regular) routine, but a) I’ve never had the time and b) I never really knew how to do it properly. Since the start of the summer, however, I’ve been making an effort to try to do some yoga each morning. I found an awesome Youtube channel called Yoga with Adriene, and she has so many great videos explaining how to do certain sequences and moves. I love how she walks you through them in detail and then shows you how to do it more fluidly. I’m definitely not flexible, but I’m slowly getting better! CAKE. As you probably have already guessed from the name of this blog, I’m allergic to nuts. (Shocker, right?) Because of this I usually stay away from anything made in a bakery, since it’s bound to be cross-contaminated with something nutty. But there’s this wonderful peanut-free bakery near where my grandparents live, and for my graduation party they brought me this huge, amazing cake. IT WAS SO GOOD, LET ME TELL YOU. As lovely as it looks, it tasted even better! June was a wonderful month for me, and I can’t wait to see what good old July has in store! What are some of your June Favorites? What do you think of mine? Let me know in the comments section below! 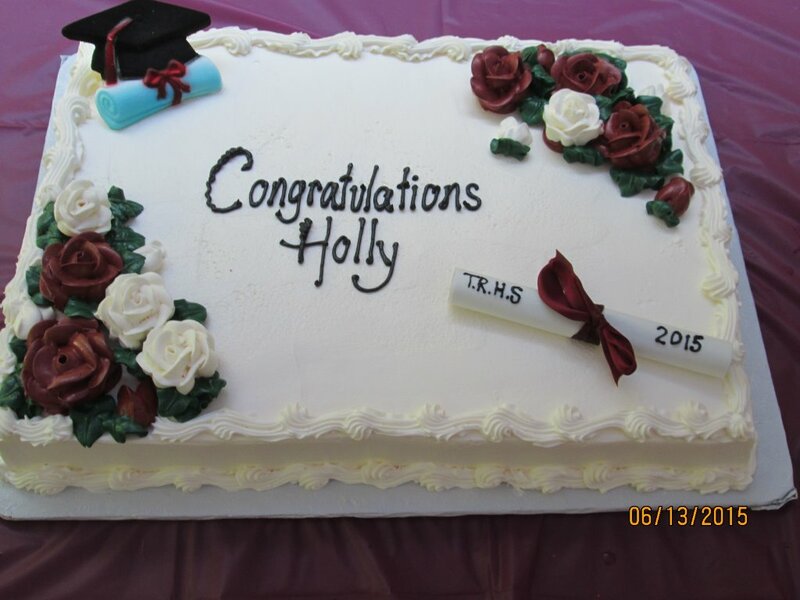 Congrats on graduating, that is a fab cake! 🙂 Have been meaning to find a yoga channel on YouTube, so I will be checking that one out for sure. Thanks for the tip! Looks like June was an exciting month! 😀 Yay for nutfree cake!